It is a post World War I cultural movement that appeared in visual arts, Literature (mainly poetry), Theatre and Graphic design. It was a protest against the barbarism of the War. Dadaists believed War was an oppressive intellectual rigidity in both: Art and everyday society. 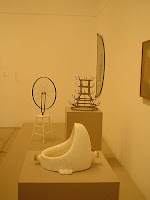 Dadaist works are characterized by its deliberate irrationality and the rejection of the prevailing standards of art. It influenced on later movements including Surrealism. According to its proponents, Dadá was not art, it was anti-Art. For everything that art stood for, Dadá was to represent the opposite. Dadça supposed that where art was concerned with aesthetics, Dadá ignored them. If art is to have at least an implicit or latent message, Dada strives to have no meaning. If art is to appeal to sensibilities, Dadá offends. Interpretation of Dadá is dependent entirely on the viewer.This movement was highly influential in Modern Art. It became a commentary on art and the world, thus becoming art itself. The artists had become disillusioned by Art, Art History and History in general. Many of them were veterans of World War I. They had grown cynical of humanity after seeing what men were capable of doing to each other on the battlefields of Europe. Members of the movement were: Hans Arp, Marcel Duchamp, Francis Picabia, Marx Ernst, Man Ray, Kurt Schwitters. They became attracted to a nihilistic view of the world. They thought that nothing mankind had achieved was worthwhile, not even Art. They created an Art in which chance and randomness formed the basis of creation. The basis of Dadá is nonsense. With the order of the world destroyed by World War I, Dadáa was a way to express the confusion that was felt by many people as their own world was turned upside down. They took normal objects but they put them in such a way that they were completely useless.These objects received the name of `ready made´. In paintings they tend to glue objects to the images, making of everything a kind of machine, something mechanic, no human.